Emmaline Neal retreated to Manningsport, New York, when her boyfriend of seventeen years dumped her seven weeks before their wedding. She and Kevin bonded as eighth graders, two Malibu misfits—a fat boy and a stuttering girl—in a place where physical perfection was the norm. She loved his kindness and his humor, and that love only increased through high school, college, and the post-college years of living together. When Emmaline gave him a gym membership to improve his health, she had no idea that it would lead to an obsession that turned Kevin into a different person, a healthier, slimmer man who preferred his fitness instructor to Emmaline. The house Emmaline and her sister inherited from their grandmother held happy memories and offered Em a place to begin a new life far away from California and memories that hurt. It was a wise move. Emmaline found a home, new friends, and new work. She loves her job as one-third of the Manningsport Police Department, and she loves being part of a tightly knit community. But the thought of arriving dateless for her ex’s destination wedding, an event that family connections make difficult for her to avoid, casts a definite blight on her life. Her friends offer a solution: Jack Holland can be her date. Jack Holland is apparently perfect. Blond, blue-eyed, and “ridiculously gorgeous,” he is also intelligent, generous, kind, and devoted to his multi-generational family. He enjoys his work as the youngest in a line of Holland winemakers, and he takes pleasure and pride in the home he had built on land where Hollands have lived and worked for eight generations. Jack added the crowning touch to his status as hometown hero when he risked his own life to pull four teenagers from a winter lake where they were trapped when the driver lost control of his speeding car. Jack’s erroneously named “Midwinter Miracle” became national news, and now Jack can hardly step outside his house without being hailed as a hero. But while his neighbors and three sets of grateful parents can’t stop praising him, Jack is dealing with PTSD and burdened with guilt that he failed the fourth boy who is on life support in a local hospital. Jack may have spent his adult life preparing to save lives, but he is not prepared for the after-effects of the “miracle.” When his sister Faith asks him to be Emmaline’s “plus one” for the wedding, he seizes the opportunity as a respite from the pressures at home. The wedding weekend is a series of misrepresentations and disasters, but it leads to a surprisingly passionate encounter between Emmaline and Jack. Emmaline is convinced that it is a night best forgotten, but Jack is persistent. However, persistence may not be enough to overcome Emmaline’s low self-esteem and the complication of Jack’s unfaithful ex-wife who is in town looking for a marriage do-over. All of Manningsport is rooting for this pair to find their HEA, but both Emmaline and Jack have to deal with baggage from their pasts before they can embrace a future with one another. 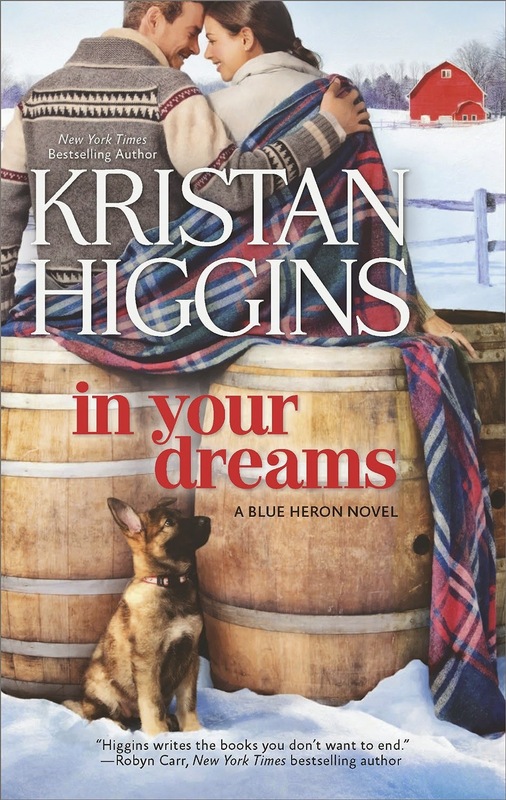 In Your Dreams is the fourth book in Kristan Higgins’s Blue Heron series, and it is a welcome addition to an excellent series. It is filled with the things that make Higgins’s books perennial favorites: hold-your-sides funny moments, families with their quirks and kerfuffles and myriad manifestations (and sometimes failures) of love, and protagonists you want to add to your circle of friends—plus, of course, puppy love for canine fans. Emmaline is a heroine in whom independence and insecurity are blended in fascinating measure, but it is Jack, who is saved from perfection by a twenty-year-old, life-altering wound, that makes this book a standout in the work of an author who has the knack for crafting keepers. If you are a Higgins fan, go straight to your preferred book source to purchase this book. If you like your romance with a generous serving of warmth and humor, this is a must-read. If you are a contemporary romance reader looking for a book that will make you laugh, set your heartstrings reverberating, and remind you why you love this sub-genre, I highly recommend In Your Dreams. I'm not usually a contemporary reader but she is a favorite along with Jill Shalvis! I discovered her in the book aisle at Walmart when I spied an adorable puppy on the cover of her second book. Of course, once I read the book she leaped directly onto my auto-buy list and hasn't wavered since. Starting this today! Kristan Higgins' books never disappoint! Cheryl, I read it yesterday. It's wonderful! I've received it too. Can't wait to find out about the Holland brother, but I want to read it at a quiet moment, where I can do only that. Bridget, it's one of those books that deserves your full attention; very funny but very emotional too. It's probably in my top three favorite books from her. This was one of my favs of her Blue Heron series. Jack was so tormented and was always trying to do the right thing for everyone. I have read all of Kristan's books & they are all keepers. I just finished this one the other day. It seemed to be longer & maybe a little deeper than previous books. I definitely laughed out loud & had some tears, too. And I'm in love with Jack! I don't think I have read any of Higgins' books, but I have 2 on my TBR shelf. I like the sound of her books. This one in particular appeals. Emmaline and Jack are the type of characters I enjoy, people who have been hurt but don't always show it. It is enjoyable seeing them grow, heal, and find the happiness they deserve.